ABC Marquees supplied 3 sizable marquees for the Home Focus Event at Pontins Camber Sands in East Sussex, which took place during the week of 25th – 31st July 2015. The Pontins Camber Sands Holiday Park with all the brilliant summer activities the site offers and beautiful local beaches, plus the chance to worship together and be inspired by special guest speakers. 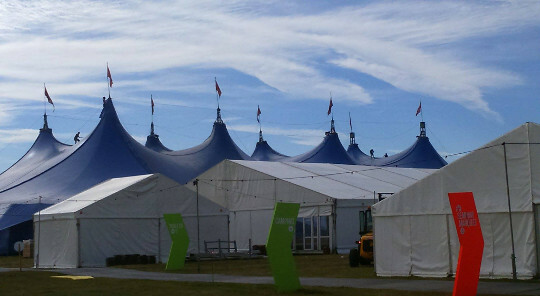 We supplied a large marquee (15m x 24m) and 2 smaller marquees (at 12m x 21m – not that small!) with flooring to meet the requirements of accommodating lots of people taking part in seminars. This was a very large week-long event – as you can see in the 4th picture of many small ‘glamping’ tents alongside our marquee – accommodating 4,500 guests in all. ABC Marquees are able to provide almost any size marquee (in 3 metre increments), from just 3 metres x 3 metres or even 15 metres x 30 metres; please contact us to discuss your requirements.